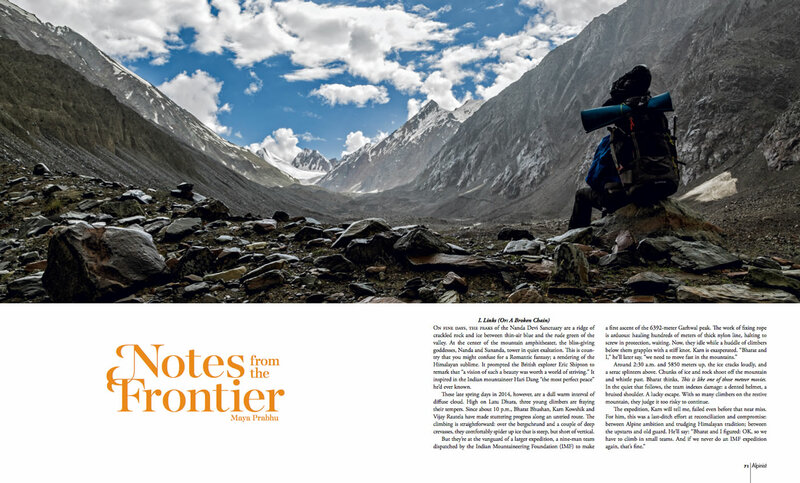 Alpinist is pleased to announce that Maya Prabhu's feature article, "Notes from the Frontier," is one of the finalists for the Banff Mountain Book Competition's Mountaineering Article Award. Prabhu's report on the "HimAlpinists," Indian climbers seeking to balance fast and light styles with the histories of their country's Himalayan peaks, appeared in Issue 54. For a full list of finalists for this and other Banff Mountain Book Competition Awards, see banffcentre.ca/articles/banff-mountain-book-competition-announces-2016-long-list. The Mountaineering Article Award premiered last year at The Banff Mountain Film and Book Festival, where Ed Douglas won for his Alpinist 49 feature, "Crazy Wisdom." This year's prize will again be awarded at the festival, which runs from October 29 to November 6 at the Banff Centre in Alberta. In other news: Alpinist Editor-in-Chief Katie Ives's Sharp End from Issue 49 has also made the "Notables List" for the 2016 Best American Sports Writing, edited by Glenn Stout. In this article, Ives tells the story of Jene Crenshaw and Helen Kilness, two women who founded the first monthly climbing magazine in the US in 1955. Chris Van Leuven's article, "Going Home," was selected for inclusion in the 2016 Best American Sports Writing anthology, as announced earlier this year.